Calcium is an important nutrient for cannabis and helps provide strength to stems and branches, and it also makes it so the plant can withstand stronger environmental conditions like high heat. When the plant does not receive enough calcium, branches become weak and flimsy, and fan leaves begin to change color. 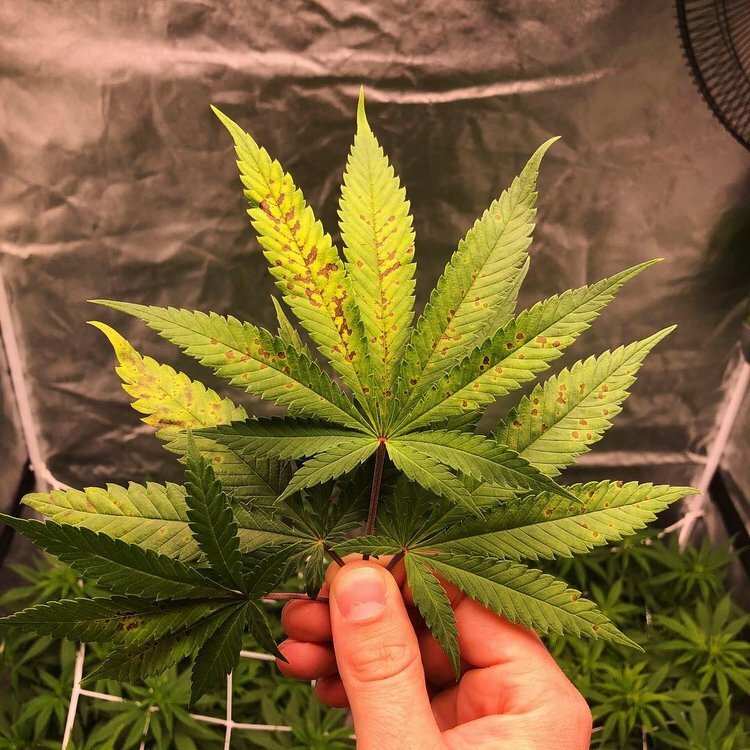 This deficiency will affect new growth first, as well as parts of the plant that are more exposed to light. Early signs will be slow growth as well as purple and brown spots on fan leaves. Later, the leaves will start to crinkle up and turn completely brown in color, and the plant will stop creating new growth. Leaves look Rusty with spots forming. Leaves are yellowing with larger rust spots. As with most deficiencies, make sure you are watering at the correct pH level before adjusting anything else. Once that has been confirmed, all you need to do is add a calcium based nutrient into your mixes. This is very easy to find and comes in the form of a Cal-Mag Product, which is a mix of Calcium and Magnesium. You only need 1 tsp per gallon of this nutrient, so be sure to not over do it!